The Manitou was commissioned on 1936 by James Lowe and built by Olin Stephen on 1937. It was originally designed to sail on the big Lakes and it won the Chicago Mackinac Race on its 1938, 1940 and 1941. On 1952 was sold to the United States Coast Guards where it was used to train the cadets on the art of sailing and teamwork. It was then when the vessel catched the attention of John F. Kennedy, who got it for a presidential use. Kennedy was a good sailor and an enthusiast of sailing. He spent that much time on the yacht that he finally called it the “Floating White House”. After that the yacht passed to be private property and has been moored at the West Coast of the United States during the last 40 years, where, until now it was one of the master pieces of the Annapolis Maritime Museum. 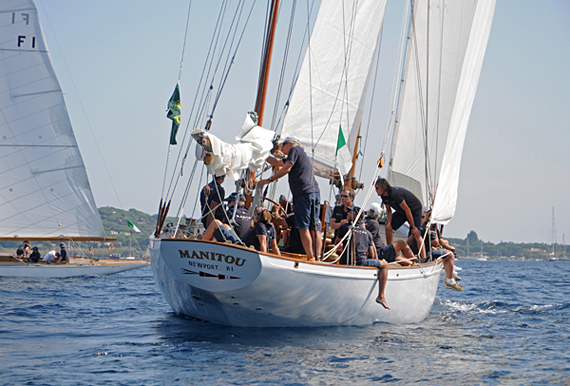 Its actual owners acquired the yacht the last Nivember, and during the last 6 months have been restored to be ready for the summer competitions such as the Classic Yacht Circuit or the Puig Vela Clàssica.